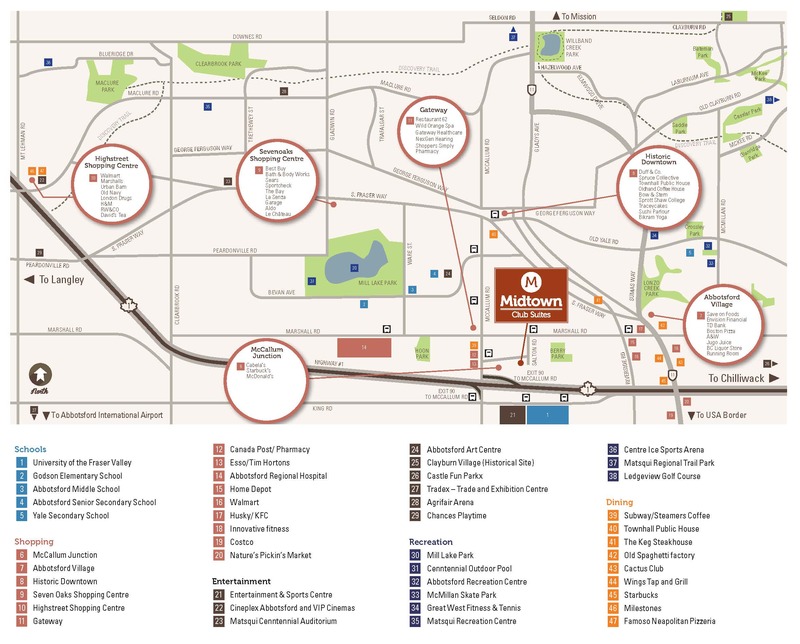 Located next to the brand new Cabela’s at McCallum Junction, MIDTOWN CLUB SUITES is a short hop off Highway 1 at the McCallum Road exit. 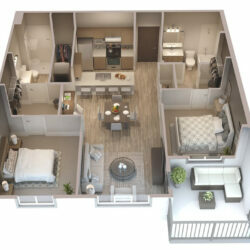 Your MIDTOWN CLUB SUITES home is smack in the center of Abbotsford’s newest, most vibrant neighbourhood referred to as the Midtown District — only steps from coffee shops, stores, and restaurants at McCallum Junction shopping center. 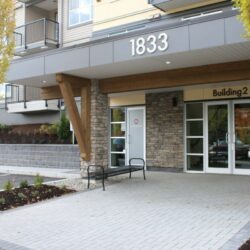 These 192 luxury rental suites are tucked between the University District and Historic Downtown Abbotsford, a location that will suit all ages and provide endless opportunities to enjoy life in this growing community. The Midtown District has many location perks – explore the immediate area surrounding these luxury rental suites by foot, or take a short 4 minute drive to Historic Downtown Abby and enjoy a few of the nearby hot spots in this reclaimed, artisan neighborhood. For many office and working professionals, the Abbotsford Regional Hospital and other business services are just down the road, for your non-commuting pleasure! Other major attractions within walking distance include the University of the Fraser Valley, Abbotsford Entertainment Centre, Cabela’s, and the ever-popular Berry Park for leisure activities outside. If you typically take the bus to work or school, you’ll love the property’s close proximity to three bus stops. Walk about five minutes from Midtown Club Suite’s front door and you’ll have an almost immediate ride. If you are one of the lucky residents at Midtown, you will have great access to everything Abbotsford and the central Fraser Valley has to offer by bike, bus, and car! In your leisure time, MIDTOWN CLUB SUITES is a short drive to the USA border crossing, Abbotsford International Airport, as well as golf courses, tons of walking and hiking trails, regional parks, and countless other recreational opportunities that abound nearby in the Fraser Valley. Get out and enjoy life!